"When the power of love overcomes the love of power, the world will know peace" ~ Indian philosopher Sri Chinmoy Ghose. Now let's compare this with the 250 million dollar F3H Demon which I flew for three years as a Naval Aviator in Advanced Fighter training in Miramar, California in 1959 ~ as well as approximately 150 all-weather landings on the USS Ranger on the Sea of Japan in 1960/61. The F3H 'Demon' served as the U.S. Navy's strong arm in the air from 1956 to 1965, when its younger brother, the famed F4 Phantom took to the skies. 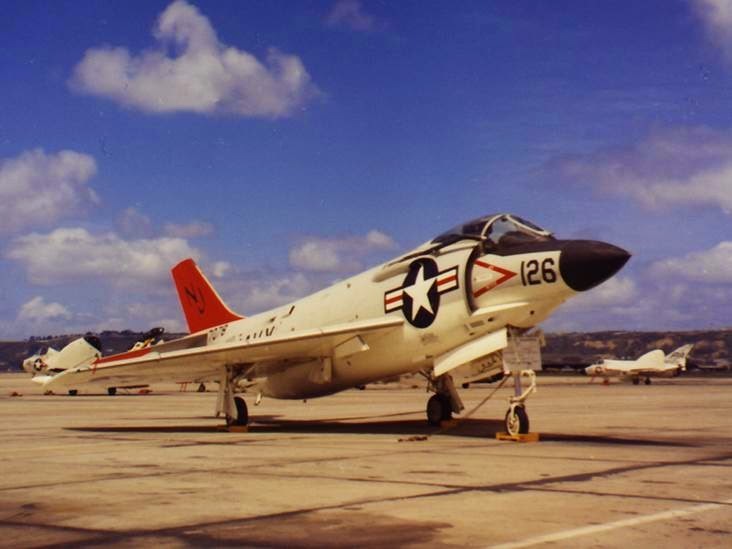 The Navy desperately needed a high performance fighter to meet the challenge of the swept-wing MiG-15 encountered over Korea. Later models, predesignated F3H-2M, were equipped to fire the Raytheon AAM-N-2 Sparrow and later the Sidewinder air-to-air missiles ~ both of which I carried and fired. Deployed aircraft carried both types of missiles, the Sparrow on the inboard rails and the Sidewinder outboard. Cannons were not used in carrier air defense applications, but they were installed and armed when situations (such as the Cuban Missile Crisis) dictated, and where the aircraft might be deployed against surface targets. Due to excellent visibility from the cockpit, the Demon earned the nickname "The Chair". Demon pilots were known colloquially as "Demon Drivers" and those who worked on the aircraft were known as "Demon Doctors". The unfavorable power-to-weight ratio gave rise to the less flattering nickname "lead sled," sometimes shortened to "sled". As an accomplished Demon Driver, I grew to love this sled for it proved to be highly maneuverable and forgiving when landing on the carrier ~ particularly at night and in all weather conditions. I also spent a year at the Navy electronics school in Memphis, Tennessee in order to learn the intricacies of the Demon's elaborate and advanced radar system. It took a tremendous commitment to become a carrier based Demon Driver and I vividly remember sitting in my cockpit on the number #1 catapult preparing for a rare early morning launch on the South China Sea in 1960, with tears running down my cheeks, as I fully realized I was living my dream ~ but that was just a prelude for later finding the courage to fully open my heart, go through my deepest fears and finally discover and own and prove my Unified Field of love and soul consciousness which lies not only beyond time and space but also beneath our deepest fears. But I digress ~ at a cost of well over 250 million and overcoming costly engine as well as ejection seat problems ~ 519 Demons were built up to the end of production in November of 1959 and finally retired in 1964. That's two years of flight operations at an operational cost of over a quarter of a Billion dollars. Now, 55 years later, we have a 1.1 trillion dollar (over 100 Billion dollars) joint Strike Fighter F35 which is not even operational and may not be by 2019 and whose mission is somewhat diminished by Drones and the out of control appetite of a greed driven Military Industrial complex. The unanswered question still remains, are our incredibly expensive fighter planes and supersonic Interceptors here to protect the fleet ~ or to provide an intimidating presence of control and dominance in a world which increasingly longs to unite in a spirit of peace, altruism and social cooperation. "Flying is hours of boredom interrupted by moments of stark sheer terror". ~ Ernest Gann is absolutely correct with this quote but it is within those moments of terror that a fighter pilot earns his wings.